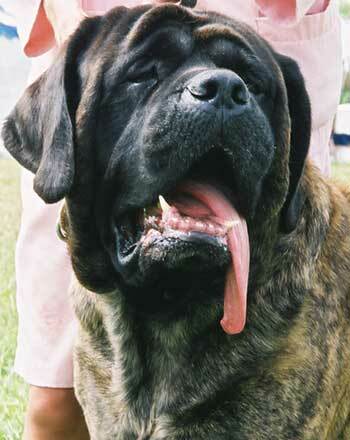 Don was a boy we co-owned with Marguerite Matter of Toadhall Mastiffs. 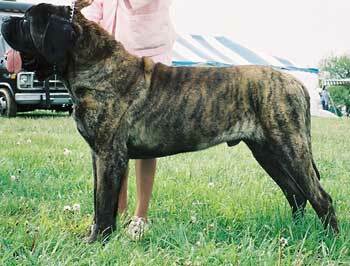 Don was so named because he was very interested in practicing his stud dog skills as a young puppy. 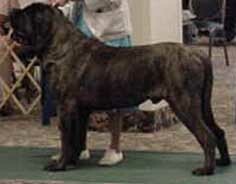 As soon as he was able to walk he was often using one of his sisters or brothers as a "mate." 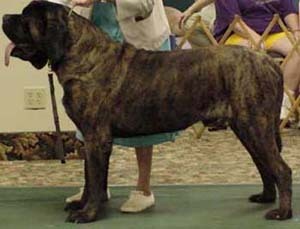 Don won 3rd place in Open Brindle Dog at the 2001 MCOA National Specialty under Dr. William Newman. Here he is waiting for his chance to show. 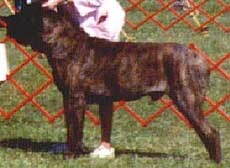 Don was a very nice apricot brindle dog that exhibited many of the traits of both his mother and father. 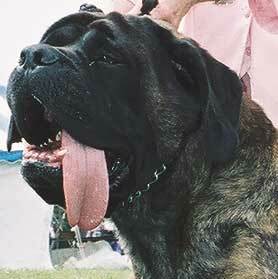 He was the sweetest, gentlest loverboy of a mastiff and he will be missed. 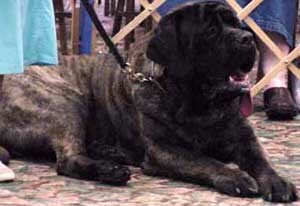 The photo to the left was taken in October 1999 at the Old Dominion Kennel Club show when he was a young dog.